Albino animals are animals that have no pigment in their bodies. Their fur and skin appear white (or pink) and their eyes are bright red because without pigment you can see the blood vessels. 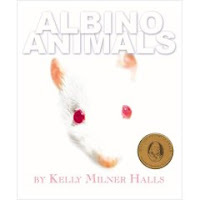 This book by Kelly Milner Halls gives an interesting introduction to all kinds of albino animals. Did you know that plants can be albino? (They don't survive past seedlings because they lack chlorophyll and can't make food.) Did you know that there have been albino penguins, buffaloes, bats, cats, dogs, and locusts? Find all of these animals and more in this photo-rich book. Halls begins with a description of albinism and how it occurs genetically. It's very rare and albino animals often can't survive in the wild. Small animals are obvious to predators and even large animals are susceptible to the sun's rays. Without pigment their skin and eyes are sensitive to UV rays. Photos accompany information about each of the albino animals presented in this book. Since they are so rare, most of the information is presented as case studies. Side boxes provide additional facts and answers about the animals. Halls has obviously done her research and she provides an extensive bibliography at the end of the book. It's no wonder that this book won a Benjamin Franklin Award in 2005. This is a topic that will surely be of interest to kids and with the great photos and interesting facts, it practically booktalks itself. Stiletto Storytime and Bibliotheque Air have more reviews and The Reading Zone listed Albino Animals as a hot book in her classroom this year. Happy Nonfiction Monday, everybody! Anastasia's got the roundup.